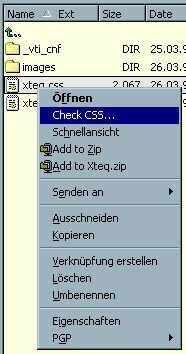 Xteq CSS Context Menu 1.0 is a little program that adds a "Check CSS..." entry in the context menu of a CSS file that, when clicked, launches the CSS test program available from microsoft.com (stylet.exe). This is mainly indent for web designers that are tired of using a COMMAND BOX for launching the CSS test program. Note: This program is no longer supported since Microsoft does not provide the program (stylet.exe) that it uses any more.